ROY, PAUL-EUGÈNE, professor, Roman Catholic priest, and archbishop; b. 8 Nov. 1859 in Berthier (Berthier-sur-Mer), Lower Canada, son of Benjamin Roy, a farmer, and Desanges Gosselin; d. 20 Feb. 1926 at Quebec. Paul-Eugène Roy was the seventh in a family of 20 children, five of whom would become priests, including Camille Roy*, the future rector of the Université Laval. He himself enrolled in a commercial course at the Collège de Lévis in the fall of 1872, but he transferred to classical studies at the Petit Séminaire de Québec the next year. After entering the Grand Séminaire de Québec in 1881, he combined teaching rhetoric (the sixth-year program) with studying theology. As a young candidate for the priesthood, he showed great promise, standing first in his class, and on 13 June 1882 the seminary council decided to send him abroad for further study in arts at the Institut Catholique de Paris and the Sorbonne. He received his licence ès lettres from the latter on 31 Dec. 1884 and embarked for Canada on the following 11 June. From 1885 to 1890 Roy taught rhetoric at the Petit Séminaire de Québec, where he left many of his handwritten lecture notes. At the same time, he gave extension courses in literature (Latin, French, and Greek) at the Université Laval and contributed to Le Canada français (Québec), a periodical published by the university. He was already known for his eloquence, unusual, rich vocabulary, and skill in communication. Roy was ordained priest on 13 June 1886. While continuing to teach, he ministered as chaplain in the parish of Saint-Zéphirin-de-Stadacona from 1888 to 1890. On 23 June 1888 he was appointed prefect of studies at the Petit Séminaire, but his advancement was blocked in the middle of the 1889–90 academic year. The reason for this abrupt halt is recorded in the seminary’s newspaper. Its account of the “academic meeting” of 24 February noted an inappropriate speech in which Roy had apparently made “a very clear allusion condemning the bachelor’s bill, and [had done so] in the presence of the Superior and in public.” This legislative measure recognized a matriculation diploma as a sufficient prerequisite for the study of law, medicine, or the profession of notary. The hapless orator’s apologies were not enough. The seminary’s governing council demanded that he resign from his posts and make amends by acknowledging its absolute authority. When the priest refused to accept the second condition, he was dismissed. He had to leave the seminary and head for the United States. On 11 March 1890 Roy entered a new phase of his life which would span nine years. Appointed curé of the parish of Sainte-Anne, in the diocese of Hartford, Conn., he did his best to gather together the French Canadians scattered across this industrial city and encourage them to retain their mother tongue. To this end he had a church, school, and parish hall built, taught classes for adults, and recruited teaching nuns. During his stay in Hartford, he adopted Blanche Authier, an orphan who would later enter religious life and become a missionary. Their spiritual correspondence would be published in Montreal in 1927. Roy returned to Quebec on 7 May 1899, having been assigned by the new archbishop, Louis-Nazaire Bégin, to raise funds for the Hôtel-Dieu du Sacré-Cœur de Jésus, which was experiencing financial difficulties. As fund-raiser, he made good use of his skills in public speaking and, first and foremost, committed himself to social action for the poor. The year 1901 proved decisive for the direction of his career. Following the boot and shoe workers’ strike at Quebec [see Gaudiose Hébert], he became one of the first chaplains to their unions, again at the archbishop’s request. Bégin entrusted him with the further responsibility of founding the parish of Notre-Dame-de-Jacques-Cartier in Quebec’s Saint-Roch ward. Roy served as its curé until 1907, while engaging in various other activities such as preaching on special occasions. He showed a particular devotion to the Sacred Heart, dedicating his parish to it. He also continued to uphold the classic nationalist position of the time: that it was through the church that French Canadians had been able to retain their language and their religion, the distinctive signs which had enabled them to survive as a nation. In 1904 he wrote three chapters of Le drapeau national des Canadiens français: un choix légitime et populaire, a work published at Quebec with the aim of getting the symbol of the Sacred Heart added to the French Canadian national flag. In 1906 Roy became heavily involved in the temperance movement. The crusade was launched in his parish with the cooperation of notary Alphonse Huard, the co-founder and editor of La Libre Parole (Québec), and then was extended to the whole diocese by Bégin’s pastoral letter of 22 Jan. 1906. As the main preacher for the campaign, Roy wanted to plant the movement’s symbolic black cross everywhere. During the third week of January 1907, for example, he preached seven sermons in Saint-Romuald; the following week he gave two in Saint-Gervais, one in Notre-Dame-de-Jacques-Cartier, and another in Saint-Sauveur. At the beginning of February he conducted a triduum (a three-day religious event) in Saint-Agapit, his fourteenth such observance in six months. His influence even extended to other dioceses. Increasingly making his mark as Bégin’s right-hand man, on 1 Feb. 1907 he was appointed by the archbishop as his delegate to the founding meeting of the Ligue Antialcoolique de Québec. It was during this intense campaign that the idea of founding the Action Sociale Catholique took shape. Study sessions, in which Abbé Stanislas-Alfred Lortie*, Abbé Charles-Octave Gagnon, lawyer Adjutor Rivard*, and Roy took part, were held frequently at the presbytery of Notre-Dame-de-Jacques-Cartier, and produced a plan that the four organizers presented to Bégin. The archbishop’s pastoral letter of 31 March 1907 created the Action Social Catholique and the Œuvre de la Presse Catholique in his archdiocese. Through its ambitious program, the first organization sought mainly to unite under one banner all the undertakings promoting Catholicism – associations, lectures, congresses, and so on – as well as to encourage new initiatives. The goal of the second was “to further the dissemination of good, wholesome, popular literature through the publication of all kinds of material in magazines, newspapers and pamphlets.” The movement, however, was born in controversy. For one thing, the Catholic Church in the diocese of Quebec was more cautious than Roy in its approach to the social Catholicism initiated by Leo XIII. Priests, especially those at the Séminaire de Québec, were not convinced that social issues required such activism, and they tended to regard the curé of Notre-Dame-de-Jacques-Cartier as overzealous. Then, too, fitting Catholicism into the new social context was also disturbing to the liberal bourgeois elite, for whom the movement threatened competition. Upon his appointment as director of the Action Sociale Catholique, Roy said goodbye to his parishioners on Sunday 14 April 1907. Thereafter he gave his full attention to promoting and organizing the new movement. He preached from platforms everywhere and addressed diverse audiences: the bishops’ assembly, priests gathered for their annual retreat, students from the Université Laval, members of the Association Catholique de la Jeunesse Canadienne-Française. He recommended numerous forms of action: study groups, lectures and congresses, publications of various kinds, religious associations (the Ligue du Sacré-Cœur, brotherhood of the Third Order of St Francis of Assisi, Sodality of Our Lady, Union Saint-Joseph, Confrérie de la Sainte-Famille, Apostleship of Prayer), associations focused on morality (temperance societies, leagues for protection against salacious books, newspapers, theatres, shows), charitable organizations (St Vincent de Paul societies, mutual aid societies), workers’ and professional groups, and economic organizations (credit unions, cooperatives, farmers’ unions). It was only gradually, and mainly from 1909, that the extensive program of study, reflection, teaching, publicity, and social action would fall into place and give direction to the Catholic forces of the archdiocese. The first result was the launching on 21 Dec. 1907 of L’Action sociale (Québec), a daily newspaper that would unquestionably be the ideological instrument with the most far-reaching influence. Not only would it continue to be published until 1973, it would also reach a wide audience, thereby spreading the viewpoint of uncompromising, “integralist” Catholicism for more than 60 years. On 8 April 1908 Roy was appointed bishop of Eleutheropolis and auxiliary of Quebec by Pius X. On 10 May he was consecrated by Archbishop Bégin and received an honorary doctorate in theology from the Université Laval. He remained director of the Action Sociale Catholique but at the same time took over much of the diocesan administration. Because of his past and his unpredictability, the authorities at the Séminaire de Québec greeted this appointment with some reservation. As a typical representative of a social Catholicism wholly dedicated to establishing the reign of Christ and associated with devotion to the Sacred Heart, Roy adopted Adveniat regnum tuum (Thy Kingdom Come) as his motto, and took the Sacred Heart and the cross as his coat of arms. In 1909 also, because of his exceptional gifts as an orator, Roy became president of the Société du Parler Français au Canada, which had been founded in 1902 by his friends Lortie and Rivard. It was Roy again who would chair the first Congrès de la Langue Française, held at Quebec in 1912 [see Lortie]. On 25 Jan. 1910, recognizing him as a patriotic Christian and champion of French culture in North America, the faculty of arts of the Université Laval conferred on him the title of professor emeritus. That year Roy also became chaplain of the Quebec regional committee of the Association Catholique de la Jeunesse Canadienne-Française, an office he would hold for ten years. In order to establish a true Christian civilization, Roy put a great deal of effort into the work of the Catholic press, of which L’Action sociale was but one example. In September 1910 he launched Le Croisé (Québec), the monthly liaison bulletin of the Action Sociale Catholique and the black cross, placing it under the patronage of St Michael. On 18 October he founded the Ligue de la Presse Catholique de Langue Française du Canada et des États-Unis, with the aim of bringing together the Catholic press. This body, which would last until the 1920s, would have 31 periodicals under its supervision in 1914. 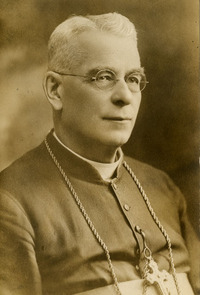 In 1913, with Charles-Octave Gagnon, Roy was assigned to reorganize La Semaine religieuse de Québec, a weekly for both the clergy and Roman Catholics in general. He started a column about the activities of the Action Sociale Catholique in this diocesan publication and changed its title by adding et Bulletin des œuvres de l’Action sociale catholique. During the same period, the Action Social Catholique’s printing press, which had been set up in 1908, also turned out numerous tracts and pamphlets. In 1917 L’Almanach de l’Action sociale catholique (Québec) began publication. Lastly, L’Apôtre (Québec), a monthly for “families that feel the need to take refuge in Christianity,” according to its prospectus, would be added to the list in 1919. On 26 June 1914 Roy became titular archbishop of Seleucia. Just like his manifold appointments, his influence and fields of activity seemed virtually boundless. With Abbé Maxime Fortin*, he worked at organizing Catholic trade unions. On 3 Oct. 1915 he went to Thetford Mines to meet the miners who were being wooed by the international unions, which dominated the labour movement at that time. The following Sunday the Union Catholique de Ouvriers Mineurs de Thetford was founded, under the direction of Abbé Fortin. In 1918 Roy would give his support to the idea of establishing a federation of Catholic unions, an initiative that led to the founding of the Canadian and Catholic Confederation of Labour in 1921. In 1916 he resumed the offensive in favour of temperance, leading a delegation to the legislature to expound to Sir Lomer Gouin and his colleagues the potential advantages of a province-wide temperance regime, in the process denouncing the fact that some members of the cabinet owned shares in breweries. In 1917 he directed the campaign of the prohibitionists, who eventually won the referendum organized at Quebec City to get the Canada Temperance Act, commonly known as the Scott Act [see Sir Richard William Scott*], applied. 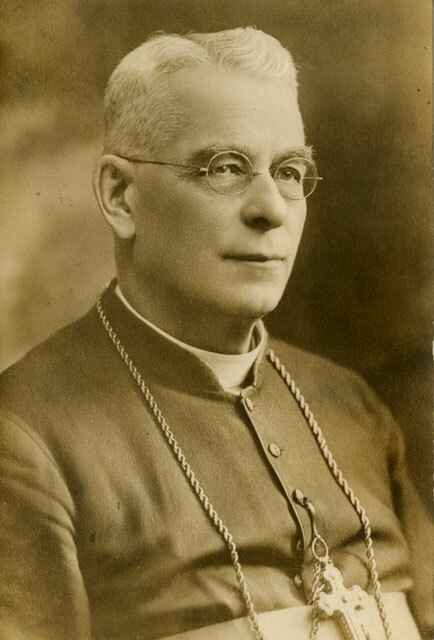 On 1 June 1920 Roy was named coadjutor archbishop of Quebec, with right of succession. The following year, just back from a holiday and rest in Europe, he became the first chairman of the administrative commission of the Séminaire des Missions Étrangères which the provincial episcopate had established in Montreal. He took part in 1922 and 1923 in founding the Hôpital du Saint-Sacrement, which he was bent on making an ecclesiastical institution. On 17 April 1923, seriously ill with cancer, Roy entered the Hôpital Saint-François d’Assise, where he would remain until his death. His illness did not prevent him from serving as president of the first Congrès Eucharistique Provincial in September 1923. Even though he could not attend the various sessions, he participated in the closing ceremony on the Plains of Abraham. Soon afterwards he gave up the leadership of the Action Sociale Catholique. Archbishop Bégin died on 18 July 1925 and Roy, despite the state of his health, became archbishop of Quebec. He would run the archdiocese from his hospital room, with Joseph-Alfred Langlois as administrator. During his archepiscopate, which would last only seven months, he wrote a pastoral letter, seven circular letters, and an instruction to the clergy. He was very proud, near the end of his life, to communicate the encyclical Quas primas, by which Pius XI proclaimed the universal reign of Christ the King. “We have been intending, from the dawn of our episcopate, to promote and strengthen within our beloved diocesan family the Kingdom of God: Adveniat regnum tuum. It is our wish that not only individuals, but all social bodies, should be subject, in full obedience of thought and action, to this sublime kingship,” he would write in the circular letter to the clergy dated 18 Jan. 1926. Roy was decorated with the pallium at the consistory of 17 Dec. 1925. He received it on his hospital bed, in a private ceremony, on 10 Jan. 1926, a few days after he had been given the last rites. He died 20 Feb. 1926 at the age of 66. In Paul-Eugène Roy, as eulogies pointed out at the time of his death, doctrine, teaching, and action were combined. Endowed with remarkable conviction and drive, he embodied the social Catholicism of Quebec at the beginning of the century, a movement that was itself incorporated into the “integralist” strain of Catholicism at that time. He succeeded in providing the Action Sociale Catholique with the organizations, instruments, and workers that defined it and guaranteed its extension. A number of institutions that came into being under his aegis (Catholic unions, cooperatives, hospitals, and so forth) remained active through the century. Roy’s vast project, to build a French Roman Catholic nation in North America under the authority of Christ the King, scarcely outlasted him, however. It represented a response from the Roman Catholic Church to the initial industrialization of the province, but did not withstand the shock of the post-war years. Paul-Eugène Roy published a number of books and articles, among them: L. A. Olivier (Lévis, Qué., 1891); “Le règne social du Sacré-Cœur,” Le Messager canadien du Sacré-Cœur (Montréal), 13 (1904): 248–52, 305–10, 357–63; L’Action sociale catholique et l’Œuvre de la presse catholique; motifs, programme, organisation, ressources (Québec, 1907); Discours religieux et patriotiques (Québec, 1926); Apôtres et apostolat (Québec, 1927); and D’une âme à une autre: correspondance spirituelle et familière avec une âme consacrée à Dieu (Montréal, 1927). He is also believed to be the author of Action sociale catholique et tempérance (Québec, 1927). AAQ, 20 A, IX: 123; 31-18 A; 61 CD, I: 7; 81 CD, II: 144. ANQ-Q, CE302-S2, 9 nov. 1859. MCQ-DSQ, P7; P10; FSQ, ms 34.3, 24 févr.–10 mars 1890; SME 9/151. “La croisade de tempérance,” La Semaine religieuse de Québec, 9 févr., 11 mai 1907. Le Devoir, 22 févr. 1926. “Notre programme,” La Semaine religieuse de Québec, 18 sept. 1913. Action Sociale Catholique, Statuts et règlements de l’Action sociale catholique (Québec, 1908). Almanach de l’Action sociale catholique (Québec), 1 (1917): 18, 40–41; 10 (1926): 35–36; 11 (1927): 10–14. Comité du Drapeau National des Canadiens Français, Le drapeau national des Canadiens français: un choix légitime et populaire (Québec, 1904). “Fondation du premier comité paroissial de l’A.S.C.,” Le Croisé (Québec), 1 (1910–11): 7–9. Histoire du catholicisme québécois, sous la direction de Nive Voisine (2 tomes in 4v. parus, Montréal, 1984– ), tome 3, vol.1 (Jean Hamelin et Nicole Gagnon, Le XXe siècle (1898–1940), 1984). Mandements, lettres pastorales et circulaires des évêques de Québec (19v. parus, Québec, 1887– ), 10: 57–69; 13: 5–77. Sœur Marie-du-Perpétuel-Secours, “Bibliographie de l’œuvre de Sa Grandeur monseigneur Paul-Eugène Roy, 1859–1926, dix-huitième évêque et huitième archevêque de Québec” (mémoire, école de bibliothéconomie, univ. Laval, Québec, 1964). “Monseigneur Roy et les caisses populaires,” Le Croisé, 1: 155. J.-T. Perron, Mgr Paul-Eugène Roy: 8ième archevêque et 18ième évêque de Québec; notes biographiques et documentaires (Québec, 1926). “Le Secrétariat général des œuvres de Québec,” Le Croisé, 1: 29. “S. G. Mgr Roy à l’Union régionale de Québec,” Le Semeur (Montréal), 8 (1911–12): 108–11. M. A. Welton, Un orateur apôtre, Mgr Paul-Eugène Roy, archevêque de Québec (1859–1926) (Québec, 1941). Gilles Routhier, “ROY, PAUL-EUGÈNE,” in Dictionary of Canadian Biography, vol. 15, University of Toronto/Université Laval, 2003–, accessed April 24, 2019, http://www.biographi.ca/en/bio/roy_paul_eugene_15E.html.